For #WerewolfWednesday, I present an excerpt from The Wolf at War, the final book in The Runes Trilogy about werewolves. A few moments later, he arrived at the plaza in the center of downtown named for the God of War, and the carnage made the name ring true. Mauled bodies littered the street. Crashed cars, some with flickers of flame, blocked the road and sidewalks. Toppled chairs cluttered the cafes and restaurants. Shattered windows in the stores gaped like the jaws of angry beasts. Bloody paw and hand prints were splattered about, as if by the brush of an angry, Pointillist God. Jets of red-tinged water shot into the air in the grand fountain. A shudder overtook Alec’s body, and his knees buckled. He tore his eyes from disaster and focused on the dark windows of his parents’ condo. Alec sprinted across the street to the security door which had been pounded open. He fought the urge to yell hello into the dark interior halls. He crossed the lobby to the stairwell. He looked up; windows on each landing lit the way. He alighted on the sixth floor and took a deep breath to steady his nerves. Each end of the hall glowed from light filtering through windows, but shadows colluded in the center of the hall. Doors to lofts hung ajar, splintered. Blood smeared the walls. Alec inched down the hall, his muscles and senses tense. He sniffed the air, but only the coppery smell of blood lifted to him. Passing a door, he nudged it open with his hand. A pile of headless bodies rested inside. His parents’ door was next. The only closed door on the floor. 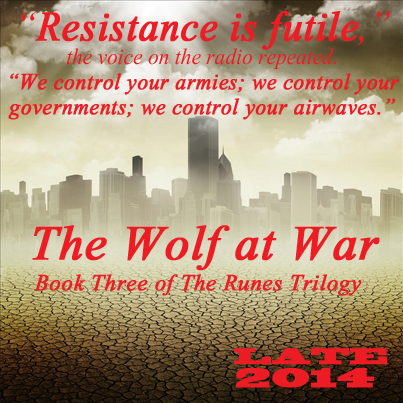 Books One and Two of The Runes Trilogy.